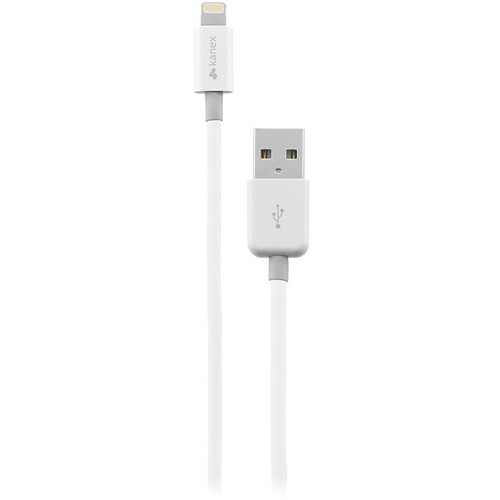 The white 9’ Lightning Connector to USB Charge/Sync Cable from Kanex connects your iPhone, iPad, or iPod with a Lightning connector to your computer’s USB port for syncing and charging. You can also connect your iPhone, iPad, or iPod to a USB power adapter for charging it from a wall outlet or car charger. This cable features slim connectors so you don't have to worry about removing bulky or extra protective cases. These little connectors are portable and can fit into tiny spaces. The cable is Apple MFi Certified, i.e., it is specifically designed to fit with your iPhone, iPad, and iPod for quality performance and reliability. Box Dimensions (LxWxH) 5.039 x 4.016 x 1.654"